Congratulations to the “Reduce, Reuse, Recycle, Read” Poster Contest Winners! To see a complete listing of NERC's Members and Supporters, as well as the benefits of membership, visit the NERC Advisory Membership web page. Award winners were announced at NERC’s 30th Anniversary Celebration in Amherst, Massachusetts. NERC is honored to recognize the award recipients for their work consistent with the NERC’s mission to promote sustainable materials management by supporting traditional and innovative solid waste best practices, focusing on waste prevention, toxics reduction, reuse, recycling and organics recovery. “The quality of the nominees and the importance of the work they have accomplished is remarkable,” commented NERC Board President Robert Isner, Connecticut Department of Energy and Environmental Protection. The Involvement in NERC Award recognizes a person who has made a substantial contribution to furthering NERC’s mission. George MacDonald of the Maine Department of Environmental Protection was the recipient. In the category of NERC Environmental Sustainability Leadership, NERC recognized three award winners. Each achieved significant environmental results through waste diversion efforts in the Northeast. In the private sector, Cox Enterprises was recognized for its national Zero Waste to Landfill program. “Cox locations in the NERC member states have implemented comprehensive waste diversion programs, led public engagement campaigns, and participated actively in environmental cleanups. The result is that their facilities have achieved an average 50 percent waste diversion rate,” noted Kaley Laleker, Maryland Department of the Environment and NERC Vice President. In the public sector category, Molly Ettenborough, Recycling & Sustainability Manager for Newburyport, Massachusetts, was the award recipient. Molly was recognized for her leadership on Zero Waste initiatives, the Newburyport Organics Pilot, and the Recycle IQ program. She has also contributed to of LED street light deployment and solar energy projects. In addition to the Environmental Sustainability Leadership Award winners, NERC recognized the following organizations and individuals for their outstanding work. Chittenden Solid Waste District, Vermont for leadership in food waste reduction strategies and programming. Casella Recycling for its recycling sustainability program and efforts to make glass recycling viable. Organix Solutions for its efforts to promote curbside collection of organics. Alisha Raby Cefalo, City of Lynn, Massachusetts, for her leadership in implementing the Recycling IQ program in the City of Lynn. The NERC 30th Anniversary Celebration featured happy reunions, sharing of memories, a special champagne toast and, of course, the award presentations. We would like to give a special thank you to the 30th anniversary sponsors, and the committee that helped throughout the year to celebrate this special occasion. There's a photo album available. Take a look! A robust crowd of more than 140 people from 25 states, the District of Columbia, and two Canadian provinces gathered at the Lord Jeffery Inn in Amherst, Massachusetts, for the Northeast Recycling Council's Fall Conference and 30th Anniversary celebration. At the conference, many of the most timely and pertinent issues of sustainable materials management were discussed. Opening the Conference was Commissioner Martin Suuberg of the Massachusetts Department of Environmental Protection, who in his remarks commended attendees for working towards solutions to issues that affect all of us. Following Commissioner Suuberg, keynote speaker David Levine of the American Sustainable Business Council (ASBC) highlighted several factors driving more widespread acceptance of sustainability. The goal of ASBC is to “help catalyze a vibrant, just, and sustainable economy,” Levine said. He pointed out that the triple bottom line—financial, environmental, and social—has grown in appeal throughout the corporate world. The appeal of the concept extends to the materials management industry, Levine continued, stressing the importance of strategies such as standardized recycling labeling, pay-as-you-throw collection programs, zero waste strategies, and extended producer responsibility. “Local recycling jobs and other materials management jobs are part of building strong local economies,” Levine said. Two days of Conference sessions addressed topics relating to the future of sustainable materials management; the involvement of brand name companies in recycling; extended producer responsibility; electronics reuse and consumers’ right to repair; reuse of surplus furnishings; training recycling industry trainers; diverse strategies for mitigating the impact of single-use plastic grocery bags; and construction and demolition debris recycling in the Northeast. Ted Siegler and Natalie Starr of DSM Environmental Services. The Conference presentations can be found in the Conference Archives section on NERC’s website. There was even television coverage! For more information about the NERC’s events, contact Mary Ann Remolador, NERC’s Assistant Director and Events Organizer. A big part of the Conference planning is developing the agenda, which requires reviewing session abstracts, selecting the topics to include in the agenda, and participating on multiple conference calls with the Agenda Planning Committee (APC). NERC would like to thank the APC for NERC’s Fall 2017 Conference. Together we were able to create a content-rich agenda that invoked many in-depth discussions. Robert Isner, Connecticut Department of Energy and Environmental Protection. For more information about the agenda planning process for NERC’s events, contact Mary Ann Remolador, NERC’s Assistant Director and Events Organizer. NERC will hold its Spring 2018 Workshop about recycling markets on April 3rd in Linthicum, Maryland and NERC’s Board Meeting is scheduled for the 4th. Be sure to save the dates! We’ll be sure to announce when the agenda and registration are available. For more information Spring Workshop, contact Mary Ann Remolador, NERC’s Assistant Director and Events Organizer. After more than a year with a vacancy in the Rhode Island Board of Directors position, NERC is delighted to announce that Jared Rhodes of the Rhode Island Resource Recycling Recovery Corporation (RIRRC) has joined the NERC Board. Mr. Rhodes recently became Director of Policy and Programs at RIRRC. Although new to the role, Mr. Rhodes draws from nearly twenty years of professional experience with local, state and quasi-governmental organizations—including with RIRRC. Rhodes was formerly Chief of the Rhode Island Statewide Planning program, where he developed a deep understanding of the solid waste challenges facing Rhode Island, mainly extending the useful life of the Central Landfill. Rhodes has also held positions with Rhode Island’s third-largest City, worked closely with its major State Agencies, and served as Vice Chair of the Rhode Island Chapter of the American Planning Association (APA RI). The Rhode Island native holds a master’s degree from the University of Rhode Island in Community and Environmental Planning and resides in East Providence. Stephen Rosario of the American Chemistry Council (ACC) has been actively involved with NERC and the Toxics in Packaging Clearinghouse (TPCH) for 27 years. And, now he has let us know that as of the end of December he will be stepping down from his position at ACC. We are all very sorry to see him go and have greatly appreciated his active involvement and support throughout the history of the organization. Stephen Rosario has been involved in, and with, government for 30 years. Currently, he is Senior Director of the Northeast Regional Office for the American Chemistry Council (ACC) responsible for all association management activities including advocacy, government affairs, issues management, communications, strategic planning and member services for a nine state region. In addition to his duties with ACC, Steve currently serves as Executive Director of the NYS Chemistry Council, a state trade association representing New York companies in the business of chemistry or that service the industry in the state. Prior to joining the ACC, Steve worked as senior legislative representative to the state legislature in Albany, NY for former New York City Mayor Edward I. Koch. He also served on the Mayor’s Executive Staff at City Hall and as Assistant Coordinator/Legislative Counsel to the Mayor’s Arson Strike Force. After leaving the Mayor’s Office, Steve became Legislative Representative for the NYC School Construction Authority responsible for legislative and community related activities dealing with federal, state and city legislators and executive agencies. Steve holds a Juris Doctor from the George Washington University National Law Center (Washington, D.C.), an M.A. in Government from New York University and a B.A. in Political Science from Queens College (NYC). He received his Certified Association Executive (CAE) designation in Association Management from the American Society of Association Executives (ASAE) in 2005 and was nominated as an ASAE Fellow, Class of 2007. 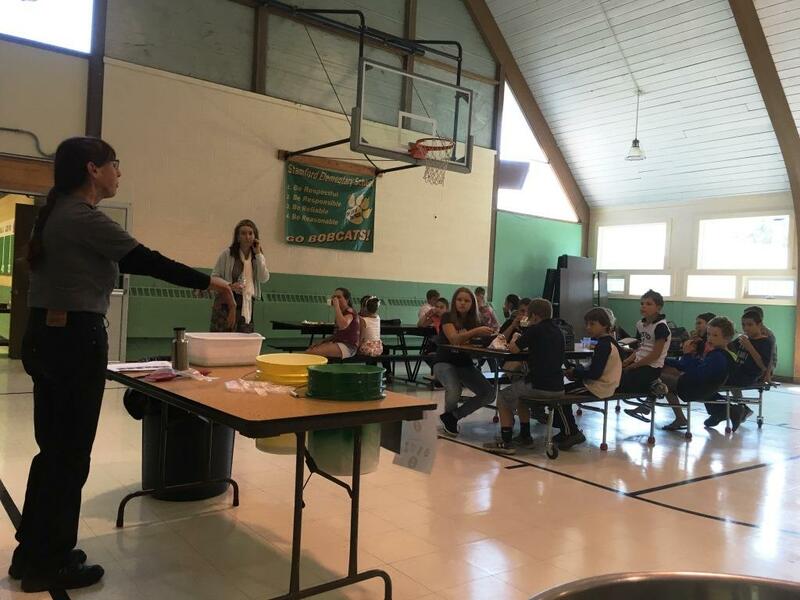 Through its contract with the Bennington County Regional Commission, NERC is providing training, technical assistance, and outreach to schools, businesses, and special events for the Bennington County Solid Waste Alliance (BCSWA). NERC’s role focuses on raising awareness about BCSWA’s waste reduction goals by promoting recycling, food waste diversion, and toxics reduction in its 13 member towns. The town of Stamford is located near the southwestern corner of Vermont, on the Massachusetts state line. This bucolic town set in the Green Mountains has a population of 824. Stamford Elementary School has 75 students in pre-kindergarten through eighth grade classes, along with 25 faculty members. In an effort to comply with Vermont’s Universal Recycling and Composting Law (Act 148) and also to promote greater environmental awareness for their students, the school principal invited the BCSWA representative and NERC to conduct a walk-though waste assessment of the school in August. Implementation of food scrap diversion and increasing the school’s recycling diversion were discussed. The school’s cafeteria manager/cook plans and prepares all meals for student breakfast and lunches. There are four lunch periods; one adult monitors each lunch period. Except for the youngest grades, students assist in wiping down tables after their lunch period. Middle-schoolers also fold up the cafeteria tables at the end of the last lunch period. School kitchen-cooked food is served on reusable trays (with compartments). Students are provided reusable silverware and small reusable plastic tumblers are used for self-serve water. Bulk condiments are provided. Students are accustomed to busing their own trays, putting silverware into a dish pan with water to soak; and, stacking their trays once emptied; students also traditionally dump milk and other leftover liquids into a bucket to keep these out of the trash. One napkin is provided to each student (with their silverware). Students are offered a variety of food choices to meet their dietary needs. Students are encouraged to take milk to drink, but are not required to do so. Fresh or canned fruit is provided for breakfast and lunch meals. All classrooms have a recycling bin for collection of paper. The bins are emptied daily by the school custodian. At the beginning of the 2017-2018 school year the school switched to a “single stream” recycling service provider. The school now recycles cardboard, mixed paper, steel cans, glass jars, aluminum cans, and plastic bottles and containers. The town of Stamford includes the school in its recycling and trash collection contract. Just prior to the start of the school year, NERC made a presentation on school cafeteria food scrap collection and diversion to the school’s teachers. Sample signage, supplies list, and images for a food scrap “collection table” were provided by NERC. A collection table was constructed by a teacher’s husband and 5-gallon collection buckets obtained. The school (through the Town of Stamford) arranged for hauling of food scraps to a commercial compost facility located in Bennington, owned and operated by TAM Organics. On the first day of school, NERC conducted a food scrap collection training and “Q&A” with the entire school. Signage was in place on the “collection table” and the school was ready for its first day of collecting food scraps. Collection was set-up for all four lunches and monitored by NERC staff. Kitchen scraps were also collected by the cafeteria manager/cook. Food collection carts and a cart of sawdust for covering the collected material were provided by TAM. All food scraps, including meat, along with napkins are accepted for composting. Student participation on the first day of food scrap collection went well. NERC reviewed the acceptable materials with the students prior to busing. The new collection table provided the students a place to sit their tray while they sorted materials. Liquid, including leftover milk, was collected in a second bucket. Because students have a choice to consume milk there is very little disposed. On the first day, one full bucket of food scraps/napkins was collected, for an estimated weight of 25 pounds. At the end of the four lunches, the middle school cafeteria helpers empty the full compost collection bucket into the collection carts and apply a thin layer of sawdust over the scraps. The cafeteria manager/cook washes the collection bucket(s) daily. A recycling bin was also put in place in the cafeteria for containers brought in with packed lunches. In October NERC returned to the school to conduct a school-wide waste sort. The event, also known as “Trash on the Lawn”, started with the collection (by the school custodian) of school recyclables, separated food scraps (destined for composting), and remaining trash. NERC sorted the recyclables and trash; all materials were weighed and recorded. The sorted materials were placed on tarps to be displayed. As the students, teachers, and staff gathered around, NERC reviewed the weights of the sorted items and discussed opportunities for additional waste reduction and recycling with the students, teachers, and staff. The school has an excellent diversion rate at 62%. It was observed that a significant portion of the remaining trash was juice boxes, chip bags, and other single-portion packaging that is not recyclable. As a result, the school principal put together a flier with ideas on reusable packaging that students could use for snacks and lunches. The flier was sent to all parents. The Stamford School community is an impressive one. Undertaking food scrap collection frequently meets with opposition and issues. The School’s administration, teachers, staff, and students were very supportive, engaging, and cooperative in making waste diversion a success. Pownal is the southwestern-most town in Vermont, bordered by Williamstown, Massachusetts, to the south and Petersburgh, New York, to the west. The town has a population of 3,527. The school has 266 pre-kindergarten through sixth grade students and around 50 teachers and staff. The school established a waste diversion team to set-up an onsite food scrap composting program. NERC provided sample signage and school composting information. In September, NERC presented about the school’s new food scrap collection to each classroom and during the older student lunch. NERC met with the compost team and made recommendations for the school’s food scrap collection and composting system. Food scraps are collected on a daily basis, diverting about 15 gallons each day. The compost team manages the collection and the compost site; the team meets weekly to discuss any issues and to share information about the science of composting. The school started a small garden last school year, so finished compost will be used to plant vegetables this coming spring. For more information contact Athena Lee Bradley. NERC's Annual Report for Fiscal Year 2017 is now available. The Toxics in Packaging Clearinghouse (TPCH) has released a new report, finding that PVC packaging on US retail shelves may violate state laws. For more information, contact Melissa Walsh Innes, TPCH Program Manager. TPCH is a program administered by the Northeast Recycling Council, which supports the implementation of toxics in packaging laws and the reduction of heavy metals in the waste stream on behalf of its member states. Learn more at the TPCH website. Recycling rules have recently been standardized across Connecticut, and now there’s an instant source of information about them, eliminating the need for guesswork about what goes into the blue recycling bin and what should be put in the garbage. The public outreach effort to increase awareness of recycling rules is being spearheaded by The RecycleCT Foundation, a state-chartered fund that combines public and private resources to support the state’s recycling goals. The outreach is built around the theme of “What’s IN, What’s OUT” and information about it can be found at www.recyclect.com. Material that cities and towns can download, customize and print to share with their residents, including a brochure with a convenient list of items that can be recycled. The outreach effort also includes social media messages for Facebook and Twitter that playfully highlight the “What’s IN, What’s OUT” theme. For further details regarding this campaign, please contact Sherill Baldwin of CT DEEP. The Baker-Polito Administration has announced $4.1 million in Sustainable Materials Recovery Program (SMRP) grants to 57 communities, regional groups and non-profit organizations for recycling, composting, reuse and source reduction activities that will reduce the amount of waste disposed of in landfills and incinerators. This is the second round of grants awarded this year through the SMRP, which was created under the Green Communities Act and is administered by the Massachusetts Department of Environmental Protection (MassDEP). Funds have been awarded in several categories, including start-up incentives for Pay-As-You-Throw (PAYT) recycling programs, mattress recycling incentives, wheeled-carts for curbside collection of recyclables and kitchen food waste for composting, large containers for collection of target materials at municipal transfer stations, funding for local recycling enforcement coordinators, school recycling assistance programs, and organics capacity building projects and innovative waste reduction projects. For more specific information, see the full press release. An alphabetical list of the city, town, regional group or non-profit organizations that have been conditionally awarded a grant, as well as more information about the SMRP program, can be seen here. September 1st, 2017 marked a very special anniversary for recycling in New York State. This date marked the 25th anniversary of the date by which all municipalities within New York State were required to adopt a local law or ordinance that mandated the source separation and segregation of recyclable or reusable materials from solid waste. To celebrate, the NYSDEC has been highlighting recycling success stories and encouraging New Yorkers to practice good recycling, reuse, and waste reduction by providing stories, tips and tricks through their social media accounts on Facebook and Twitter. The social media campaign began September 1st and will run until New York Recycles Day on November 15th, using the hashtag #NYRecycles1992. The 25th anniversary social media campaign kicked off by celebrating exceptional recycling and waste reduction accomplishments in counties, cities, towns, and villages in each of DEC’s 9 regions throughout the state. The town of Brookhaven, Westchester County, The New York City Department of Sanitation, Town of Bethlehem, Fulton County, the Oneida-Herkimer Solid Waste Authority, Madison County, Monroe County, and the City of Buffalo were all highlighted on DEC’s social media pages with photos and descriptions of their recycling and waste reduction success stories. Accomplishments include increased diversion of materials from landfills via textile, tire, metal, battery, ag plastic, cell phone and light bulb recycling, food scrap collection and compost sites, creative materials reuse programs and generally increasing recycling rates. Other success stories include an award winning recycling education center, a mobile web app to clear up confusion about recycling, electronics recycling, repair cafes, and costs savings enjoyed through these sustainability initiatives. The celebration continues with tips and information each week with themes such as plastic bag recycling, respecting the blue bin, littering, recycling on the go, organics, reuse, textiles, and product stewardship. Thursdays feature “TBT’s” or “throwback Thursdays” sharing historical photos from New York’s recycling history, such as WWII newspaper salvage drives, recycling and vermicomposting articles from the 90’s in Dec’s Conservationist magazine, and DEC’s Commissioner in the early 90’s dropping the first recyclables into a new container. Visit the DEC’s Facebook and Twitter Pages and use the hashtag #NYRecycles1992 to learn more about the 25th anniversary campaign. New York State Department of Environmental Conservation (DEC) Commissioner Basil Seggos today recognized seven organizations for their state-of-the-art programs and commitment to environmental sustainability, social responsibility, and economic viability at the 14th Annual New York State Environmental Excellence Awards celebration, held at Union College’s Park Hall. At the event, the awards were presented by DEC acting Chief of Staff Julie Tighe. Bethlehem School District’s Green Team (Albany County): Bethlehem School District is an outstanding model of innovative environmental education and student engagement. Almost a decade ago, the district formed a “Green Team,” a partnership of dedicated administrators, teachers, parents, and students cultivating environmental awareness, responsibility, and leadership in the district’s schools, as well as within the larger community. The district demonstrates an impressive and wide-reaching educational model that has resulted in annual accomplishments that include recycling more than 96,000 pounds of paper, composting more than 20,000 pounds of food waste, donating more than 1,000 pounds of fresh, organic produce to the Bethlehem Food Pantry, and partnering with a local restaurant to offer a special menu featuring produce grown in the school’s gardens. Chautauqua County Department of Planning and Economic Development’s Stewardship of Aquatic Resources (Chautauqua County): Most New York municipalities collect an occupancy tax from visitors who stay in hotels, motels, and bed and breakfasts. Instead of being placed in a general fund, Chautauqua County invests the revenue in projects and programs that promote the sustainable use of its natural resources. This approach demonstrates the important connection between having healthy lakes, streams, and ponds while also enjoying a strong tourism-based economy. Over the past eight years, the county has invested $2.6 million from the hotel occupancy tax revenue in water quality improvement projects. As a result, the county has received plans for an estimated $50 million in hotel and hospitality investments. Chautauqua County’s water resource improvements include: removing nearly 14 million pounds of aquatic vegetation from Chautauqua Lake; eliminating more than 360 tons of soil entering waterways through various soil stabilization projects; and reducing nearly 400 pounds of phosphorus and 850 pounds of nitrogen from entering waterways by investing in green infrastructure such as rain gardens, vegetated swales, and porous pavements. Hudson River Sloop Clearwater’s Great Hudson River Revival Zero Waste Initiative (Westchester County): Clearwater’s longtime strategy of inspiring, educating, and engaging people is a powerful formula for success. The Clearwater’s Great Hudson River Revival (Revival) began in 1978 as a series of small concerts to increase environmental awareness and raise funds for the Sloop Clearwater. Today, it is a national model for organizations wishing to reduce the environmental footprint of large public events. The annual revival draws up to 20,000 attendees, in addition to at least 1,500 volunteers, musicians, and vendors. Event coordinators offer a sustainable event that actively engages attendees in waste reduction, recycling, composting, and sustainable living. Composting and recycling stations are conveniently set up around the festival grounds and trained volunteers help people put things in correct bins and take care of materials disposed of incorrectly. The event has, over the past several years, diverted an impressive 80 percent of waste from landfill including 4 tons of recyclables and 33 tons of compostable material. NYS Department of Transportation Region 4 and Seneca Park Zoo Society’s Pollinator Protection Project (Livingston County): This innovative effort by the New York State Department of Transportation’s (DOT) Region 4 office demonstrates a commitment to sustainability, motorist safety, and pollinator habitat protection. The initiative directly supports the Pollinator Protection Plan to Protect New York’s Agricultural Economy developed by Governor Andrew Cuomo’s Pollinator Task Force. In 2015, DOT Region 4 modified the mowing schedule for a six-mile section of Interstate I-390 between Route 408 (Mt. Morris) and Route 258 (Sonyea) near Rochester. This 93-acre area offers refuge for migrating monarch butterflies and other pollinators. As a result, there are now more than 18 species of naturally regenerating wildflowers and grasses providing food and habitat for pollinators. Bees and butterflies are now able to successfully complete their life-cycle without being disrupted or damaged by mowing. DOT Region 4 is working in partnership with the Seneca Park Zoo Society and two interpretive gardens are now thriving at the Mount Morris and Geneseo Rest Areas. Nearly 13,300 vehicles travel this section of I-390 each day. Educational signs at the gardens give rest area visitors information about the plight of pollinators and provide tips about what New Yorkers can do to protect these important species. Oneida-Herkimer Solid Waste Authority’s Go Green School Recycling Program (Oneida County): Dedicated to advancing innovative solid waste solutions, the Oneida-Herkimer Solid Waste Authority has helped pioneer the greening of Oneida and Herkimer counties. The authority has been recognized as a national model for its regional recycling efforts. The authority’s Go Green School Recycling Program is an example of a well-designed and creatively implemented education/outreach and engagement program, which involves all but two of the 30 public and private school systems in the two-county area. In addition, the authority’s Recycling Educator successfully engages students, teachers, custodians, parents, and school faculty in recycling and composting programs. Participating school districts realize significant benefits, including substantially reducing waste being generated, helping to reduce greenhouse gas generation, conserving natural resources, and achieving direct cost savings. One elementary school is now annually diverting 10 tons of material from the landfill while sending 40 tons of material for recycling, which means an annual savings of nearly $2,000. Ulster County’s Net Carbon Neutral Operations (Ulster County): Ulster County has received national recognition for its outstanding commitment to environmental stewardship and is one of only three New York municipalities certified by DEC as a Bronze Level Climate Smart Community. County leadership is dedicated to increasing the county’s energy conservation, energy efficiency, and renewable energy generation. Specifically, Ulster County is purchasing 100 percent green electricity from sustainable sources, prohibiting all food service providers from using polystyrene foam, and promoting safer alternatives; expanding and improving the operation of the composting facility at the Ulster County Resource Recovery Agency in Kingston; greening and right-sizing their vehicle fleet by adding seven plug in hybrid sedans and one all-electric vehicle in 2017; and installing a network of nine charging stations at county-owned facilities. This is the greatest number of municipal electric vehicle charging sites in the State, including New York City. The chargers, powered by renewable energy, provided nearly 1,400 charging sessions, saving more than 1,700 gallons of gas. DEC established the Environmental Excellence Awards in 2004 to recognize those who are working to improve and protect New York’s environment and contribute to a healthier economy by advancing sustainable practices and forming creative partnerships. To date, DEC has recognized 80 award winners. They are an elite group of committed organizations leading by example and serving as models of excellence within their industry and community. Union College, host of this year’s award ceremony, was an award recipient in 2008 for its campus-wide commitment to sustainability. A statewide review committee, made up of 20 representatives from the public and private sectors, shared advice in selecting the award winners from an array of competitive applications received in May. For additional information about the program and past winners, and to learn about applying for the 2018 Environmental Excellence Awards, visit DEC’s website. Applicants should upload their cover letter with their resume in one electronic file (word doc. or pdf). If you would like more information about this position, please contact Joshua Kelly at josh.kelly@vermont.gov. The Environmental Analyst IV will be working in the Solid Waste Program of the Waste Management and Prevention Division of the Vermont Department of Environmental Conservation. Primary responsibilities include implementing the state’s Universal Recycling law (Act 148), the statewide materials management plan, and assisting with other materials management programs and priorities. A focus of the work will be on organics diversion and recycling outreach and tracking, specifically to businesses, institutions, and residents. Other duties include working with and supporting solid waste districts, municipalities, haulers, facilities, and other stakeholders to improve organics diversion and waste reduction in Vermont, and developing and disseminating outreach materials. Planning, analytical and administrative work at an advanced professional level for the Department of Environmental Conservation. Duties involve complex tasks in the technical review and analysis of environmental policies, programs, activities and data in a variety of regulatory, non-regulatory, scientific, and engineering programs. Work involves considerable independence in completing work assignments and greater responsibility and accountability than lower level analyst work. May provide project or program oversight and/or supervise program staff or provide expertise in a specialized technology or program element which is not duplicated in the Department. Work is performed under the general direction of a higher-level technical or administrative superior. To view the full job description, visit the Job Specification page. Bachelor's degree in a biological-life or physical science, engineering, or an environmental or natural resources field AND four (4) years or more at a professional level in an environmental or natural resources field. Master's degree or higher in an environmental or natural resources field AND two (2) years or more at a professional level in an environmental or natural resources field. Two (2) years or more as an Environmental Analyst III. Excellent outreach communication skills, especially with diverse audiences such as residents, businesses, haulers, and municipalities regarding compliance and policy issues. Experience in developing environmental plans and policy and in the implementation of such plans. Knowledge of organics, recycling, and solid waste management, programs, and planning. Should you submit an application for this job opening, you certify that all information entered is correct and complete to the best of your knowledge. By submitting an application, you acknowledge and understand that the State of Vermont may verify information, and that untruthful or misleading answers are cause for rejection of this application, and/or dismissal if employed with the State of Vermont. The $2-per-ton fee recycling fee established in Act 101 was due to sunset January 1, 2020. Elimination of the Recycling Fund supported by that fee would have devastated local programs and businesses established to support the industry. PROP is happy to report that the sunset date has been removed. Language in HB 118 effectively removes the sunset date from the $2 recycling fee and maintains the Recycling Fund. The bill (now Act 40 of 2017) was signed into law by Governor Wolf on October 30, 2017. PROP would like to thank members and affiliated organizations for the many phone calls, letters and visits to legislators to make this happen. One note of caution, the Fiscal Code does allow the Governor discretion to transfer money out of any lapsed funds. Continued advocacy will be needed to ensure that does not include the Recycling Fund this year. PROP will communicate with members as news develops. This fall, the Centre County Recycling & Refuse Authority, Weis Markets and the Centre Daily Times kicked off a poster contest that was open to all 5th grade students in Centre County. The students were asked to design a poster around the theme “Reduce, Reuse, Recycle, Read.” We received hundreds of entries, and on October 13, fifteen artists were selected as our winners. We would like to congratulate the following students for their winning posters: Ally Duncan, Gray’s Woods Elementary School; Blake Wheeler, Wingate Elementary School; Cedric Bagwell, Benner Elementary School; Emily Lovrak, Pleasant Gap Elementary School; Emma Haagen, Marion Walker Elementary School; Erika Lucas, Philipsburg-Osceola Middle School; Hannah Rose Craig, Our Lady of Victory; Isabel Olson, Gray’s Woods Elementary School; Jade Brown, Pleasant Gap Elementary School; Lillian Hodges, Centre Learning Community Charter School; Madison Stimer, Port Matilda Elementary School; Marinn Peters, Penns Valley Intermediate School; Poppy Rusca, Park Forest Elementary School; Sena Andrews, Mountain Top Elementary School and Taylor Brown, Marion Walker Elementary School. The 15 winning posters will be made into a 2018 “Reduce, Reuse, Recycle, Read” wall calendar that will be distributed to all 5th grade students in Centre County. The calendars will also be available free of charge at our five local Weis Markets stores. For additional information, please contact Joanne Shafer at 814-238-7005, or by e-mail. At the recent Electronics Reuse Conference, Robin Ingenthron of Goo d Point Recycling and WR3A was presented with the Jim Lynch Lifetime Achievement award, which recognizes lifetime achievements in the electronics reuse and IT asset disposition industry. You can read more about the award and Robin's remarks made as part of the ceremony in his blog. The Zero Waste Principles & Practices course provides an understanding of the principles on which Zero Waste is based. It covers training for all stages of Zero Waste program implementation, including upstream, midstream, and downstream strategies and practices. The course is a training tool for solid waste professionals, sustainability specialists, and policy makers who are working to move their communities toward meeting community-specific Zero Waste goals. The course modules span a variety of industry topics including public policy, collection options, processing technologies, organics management, program financing, contract management, and effective education and outreach strategies. Kessler and Robin Mitchell, KCI Director of Technical Services, are certified course instructors. Additional information about the course and enrollment can be found on the SWANA website. The Maine Resource Recovery Association (MRRA) announces the election of their 2018 Board of Directors to serve one-year terms. Re-joining the Board of Directors after a brief break are Jim Guerra, Manager of Mid-Coast Solid Waste Corporation in Rockport and Steve Lewis, Manager of the Boothbay Region Refuse District. MRRA also expresses thanks for years of dedicated service to outgoing board members Lee Leiner and Mark Draper. Leiner is the Public Works Director of the City of Bath, ME and Draper is Solid Waste Director of Tri-Community Recycling & Sanitary Landfill in Aroostook County. The elections were held on October 23rd at Jeff’s Catering in Brewer, ME during MRRA’s Fall Workshop and Annual Membership Meeting. For more information, please go to www.mrra.net or call 942-6772. Maine Resource Recovery Association (MRRA) announces a return to the Samoset Resort in Rockport, ME for the 25th Annual Maine Recycling and Solid Waste Conference & Trade Show. The two-day event, “Betting on Innovation” will be held April 23-24, 2018 with a vendor and welcome reception on Sunday, April 23rd and a casino night on Monday. Municipal officials, industry experts, solid waste professionals and over 35 vendors will gather for education, networking and exhibits. Plan to join us for Maine's only integrated conference for the Solid Waste Industry. Vendor and Registration packets are available online. The Professional Recycling of Pennsylvania (PROP) is an association of recycling professionals working to ensure that all recyclable materials in the Pennsylvania waste stream are, in fact, optimally recycled. PROP uses a variety of programs and tools to connect, educate and inform our members and the recycling community to help them develop and maintain the skills, knowledge and ability needed to realize our vision. The nationally recognized Pennsylvania Recycling Professional Certification Program provides a cost effective method to become nationally certified as a Recycling Professional. The Penn State Accredited Recycling Certification Program (40 hours) can be completed over three sets of classes in less than one year. The Pennsylvania Recycling Professional Certificate Program meets the requirements of the National Standards Certification Board. These standards meet all learning objectives and promote the establishment of high professional standards for recycling, sustainable resource management, organics, and solid waste managers in both the public and private sectors. New professionals entering the field will gain a solid foundation of industry concepts. Further information on our certification program can be found on our website. The CT Recyclers Conference is an annual, day-long event featuring a robust discussion of key issues facing the recycling and materials management industries and markets in Connecticut, as well as the impacts on the many customers and stakeholders in the state. What's to come from packaging reduction Task Force efforts? What's at stake with Connecticut's bottle deposit system? What's the status of organics recycling in Connecticut? Contact Ray Collins at (203) 233-6670 or Julie Cammarata (203) 496-0997 or via email at ctrecyclers@gmail.com for more information. The holiday season offers numerous opportunities for reflection. For many, this reflection revolves around our relationship with consumerism. However, there is a growing movement toward more thoughtful and creative ways of celebrating the holidays and gift giving practices. Thoughtful giving puts greater meaning into the gifts we offer. It’s also a way to reduce our holiday environmental footprint and support our local, regional, and national economies. Alternatively, our gifts can help farmers and producers in less developed countries. Giving a gift of “experience,” such as performances or museums, is a way of exploring our communities with family and friends, and creates new adventures and memories. Buy local. Supporting our local or regional economies, by purchasing locally manufactured, grown, or crafted items, is a positive way to invest our money in our communities. This of course has a multiplier effect—supporting local industry, farmers, artists, and others keeps your money local, and in turn this money is then spent on local food, entertainment, etc. Most local gift opportunities, including cheeses, wine, beer, other hand crafted spirits, baked goods, and art and crafts, are produced with local resources and generate less pollution associated with shipping and industrial manufacturing. Fair Trade Products. Purchasing “Fair Trade” products, such as chocolates, coffee, teas, or other consumer items, including soaps or crafted items, helps support farmers and producers from around the world. Fair Trade purchasing also helps ensure that agricultural practices are environmentally and socially sustainable. The Rainforest Alliance, an international nonprofit, is an organization which sells such items; Fair Trade America is another source Fair Trade products. Many local food coops and other shops also carry Fair Trade products. Helping those in other countries who are less fortunate expresses the true meaning of the spirit of the holiday season in our gift giving. Green Purchasing. If toys, electronics, or other consumer items are on your gift giving list, consider energy efficient items. Use rechargeable batteries in products that require batteries. Look for durability in the gifts you choose; more durable items may cost more, but they will last longer and ultimately have a smaller environmental footprint. Consider taking family members on a shopping spree to a secondhand store. Vintage clothing, furniture, and more, offer fun and meaningful gift giving opportunities. Reuse Stores are great shopping fun for those who like to tinker and build. Also, consider “closing the loop” when possible by purchasing “green products” made with post-consumer recycled content. Clothing made from organic cotton or hemp also has a smaller environmental footprint. Teaching children (and adults) about donating unwanted toys, clothing, and other items that are in good usable condition will help support a more thoughtful holiday season for everyone. Donating will also reduce clutter and make room for new gifts. For more thoughtful gift giving ideas that support a reduced environmental footprint, check out New Dream’s 15 Tips for Commercial-free, Fun-filled Family Holidays. Advanced meal planning, smart shopping, and preparing for leftovers will help everyone enjoy holiday meals while also limiting waste. The "Guest-imator" is a new tool developed by the Ad Council and the Natural Resources Defense Council's Save The Food national public service campaign. The “Guest-imator” can be used to plan a menu according to the number of people who will be eating and what will be served. Check cupboards and the refrigerator and freezer, to see what is already on hand; make your shopping list accordingly. Stick to the list! Try to resist impulse purchases and unnecessary sale items! Using smaller plates at meal time can encourage guests to take smaller portions. You can politely suggest to your guests that if they take smaller portions, they can return for additional helpings if they are still hungry. Letting guests serve themselves will help reduce the amount of unwanted food left on plates. Remember food safety…hot foods shouldn’t be left out for longer than two hours. Stock up on empty containers (yogurt, butter, plastic to go containers), freezer bags, and foil to use for storing leftovers. Having labels (or masking tape) and ink pens handy will make leftover preparation easy and fun. Send leftovers home with guests (who will eat them, freeze them, or share them). Plan for lunches and quick meals by storing leftovers in smaller individually-sized containers. Consider freezing foods for later use. There are loads of tips on the Internet for safe freezing, what items freeze well, and how best to store and label. Be creative with leftovers—explore new recipes. The Internet is filled with creative cooking ideas for leftovers! Love Food Hate Waste also offers some excellent leftovers recipes. The holidays are a good time to practice the spirit of the season, by donating food and other items to food rescue organizations, shelters, and other entities helping those less fortunate. And, of course, remember to compost, or feed any food scraps to the backyard chickens! Happy Holidays and Best Wishes for the Coming Year from the NERC Staff! In late October I was on a China panel at the Canadian Waste & Recycling Conference. My fellow panelists were Paulina Leung of Emterra Paper, Eadaion Quinn of Canada Fibers and Catherine Habermebl of the Region of Niagara. I knew they would provide a solid description of the current situation, so I decided to focus on what I called “Eight Thoughts in Eight Minutes”–a broader look at recycling in general and the current market upheaval. Recyclables are commodities. We keep forgetting that recyclables are commodities whose market value fluctuates due to supply and demand. In fact, their value fluctuates more than that any other commodity. Why? Recyclables are at the tail end of raw material demand because their quantity and quality are not as predictable as that of their virgin raw material competitors. While the quantity of recyclables is increasingly predictable, the quality is not. Demand and supply. Recycling used to be an industry which was ruled by supply and demand, or, more accurately, demand and supply. As scrap industry veterans say, scrap is bought not sold. Curbside collection destroyed the normal balance between demand and supply because it created an unending supply that is unconstrained by market demand. Curbside recyclables keep rolling in regardless of whether or not manufacturers need raw materials. We’ve been here before. The sudden rise of curbside programs caused a massive collapse of markets in the late 80’s and early 90’s. Since then we suffered one other big drop in the 90’s, two in the aughts including the horror show of 2008, a dip in 2013 and now this. Markets always bounce back. Sometimes it takes a while and the wait can be painful. Most scrap dealers expect to lose money at least one of every four years. They plan for it. Maybe curbside programs need to adopt this strategy. We need to start thinking long term, not short term, and focus on five or 10 or 15 year averages, not the price of the day. New markets will arise. Already mills in other Asian countries are taking up the slack, but they have less total demand than China and they pay less. A recent Wall Street Journal article showed how American manufacturers are seeing value in these newly low priced recyclables as a new feedstock. After all, one industry’s pain is another’s pleasure. The increasing amount of "browns" in mixed paper is spurring this trend. We will see more North American paper mills with stock preparation systems designed to take mixed paper as a normal feedstock. But they won’t open overnight. We now have three levels of specifications. First the Institute of Scrap Recycling Industries (ISRI) specifications which set something of a baseline—a way of communicating what is meant by Old Corrugated Containers and Mixed Paper, etc. More important, however, are the buyers specifications which don’t always conform with ISRI’s. Let’s be candid. The modern Chinese linerboard mills were built with the expectation of processing North American mixed paper. So are Pratt Industries’ mills, which are the only real U.S. market for this grade. Packers met those mills' specifications. It’s worth noting that the National Sword in February got little notice and had little impact on North American recycled paper shipments. It was the announcement of the ban in late July and the failure to issue import licenses in the fall that attracted attention. Now the Chinese government has created a third level of specifications. The new requirement of 0.3 percent contamination is an impossible standard. It’s purer than Ivory Soap and is lower than the existing, challenging to meet, 1.5 percent standard. This raises the obvious question: given the need of Chinese mills for inexpensive fiber, the skyrocketing price of domestic recyclables in China and the cost to Chinese mills of importing virgin linerboard pulp from North America, what level of contamination will the government enforce? This is why quality counts. Paper is getting a bad rap. As Bill Moore has noted, smell does not equal garbage. Finished paper products have a low rate of moisture content. Paper in MSW has about a 6 percent moisture content due to being mixed with wet waste. Recycled fiber is probably the same or more. Bale it, put it in a container, ship it across the ocean and open the container two or three months later and of course it will smell. Which raises the question, are any companies that bale and ship paper overseas looking for ways to lower this naturally occurring decomposition? Keep China Beautiful. We should take the Chinese government’s desire for a clean environment seriously. The country has a growing middle class. They want to enjoy the benefits of affluence in a clean environment. Beijing this week is gloriously free of pollution but unfortunately the Party Congress is only held every five years. The Chinese people want better. Don’t always expect rational economic behavior. After all, Richard Thaler won the Nobel Economics Prize this year for his work on behavioral economics and the reality that we don’t always make rational economic decisions. Yes, over the long term, the Chinese government is likely to come to an understanding of what is good and bad for the environment and economy. Yes, markets always bat last. But the immediate issue is how much short term pain will we will suffer. I added at the end that as far as the long term goes, I’m an optimist. You can’t survive in this business if you aren’t. But I am also a realist and I expect the next six months will be very interesting.